Guatemala is implementing an extensive legal framework that guarantees the funding of and access to high-quality family planning services. 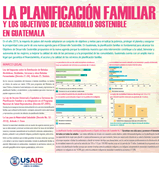 This poster demonstrates how family planning contributes to the health, well-being, and self-sufficiency of women; improves people's quality of life; and builds prosperity; and shows how Guatemala's legal framework is helping to accelerate progress toward these aims and the realization of the Sustainable Development Goals. Health and Education Policy Plus. 2017. 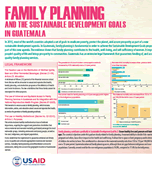 Family Planning and the Sustainable Development Goals in Guatemala. Washington, DC: Palladium, Health and Education Policy Plus. Health and Education Policy Plus. 2017. La Planificación Familiar y los Objectivos de Desarrollo Sostenible en Guatemala. Washington, DC: Palladium, Health and Education Policy Plus.